To make the sauce, in a saucepan over medium heat, combine the soy sauce, mirin, sugar, ginger and garlic. Bring the mixture to a boil, then reduce the heat to low and simmer until the mixture becomes slightly syrupy, about 5 minutes. Let cool. Place the salmon in a shallow baking dish. Pour half of the teriyaki sauce over the salmon and refrigerate for 1 hour.Reserve the other half of the sauce. Prepare a charcoal grill for medium-high heat. Clean and oil the grill grate. Brush the cut sides of the zucchini with some of the reserved teriyaki and arrange on the one side of the grill. Remove the salmon from the teriyaki, letting any excess drip off, and place skin-side-down over the other side of the grill. Cover the grill and cook until the salmon is medium-rare to medium. 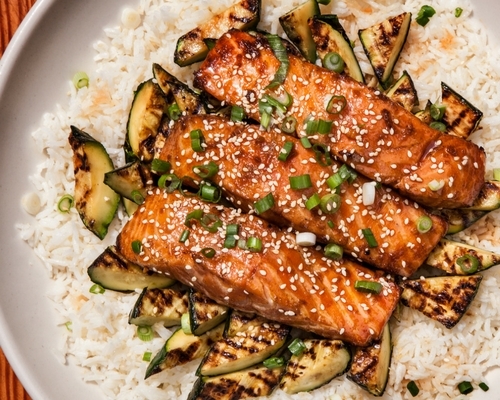 Transfer the salmon and zucchini to a platter, garnish with the green onions, and serve with rice. Pass more of the reserved sauce on the side.